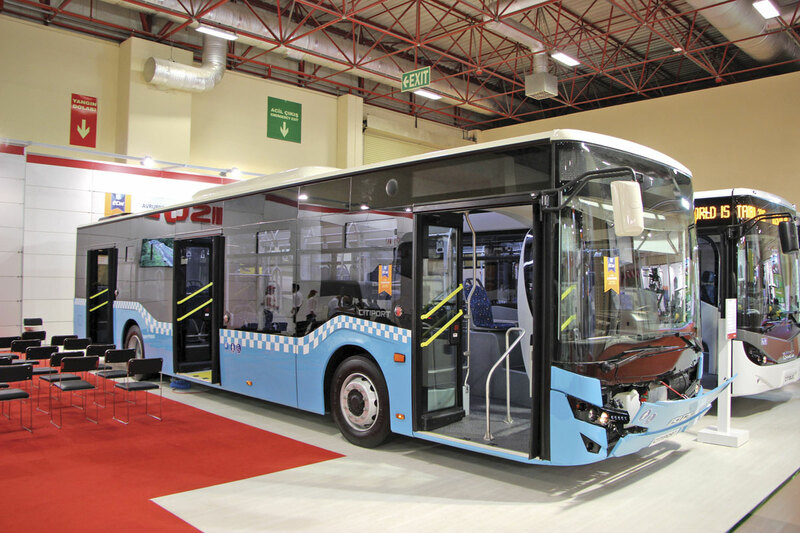 Held every two years, at the Istanbul Expo Centre which is handily located close to Ataturk International Airport, Busworld Turkey brings together manufacturers, converters and suppliers from a manufacturing industry that has become increasingly significant over the past couple of decades. 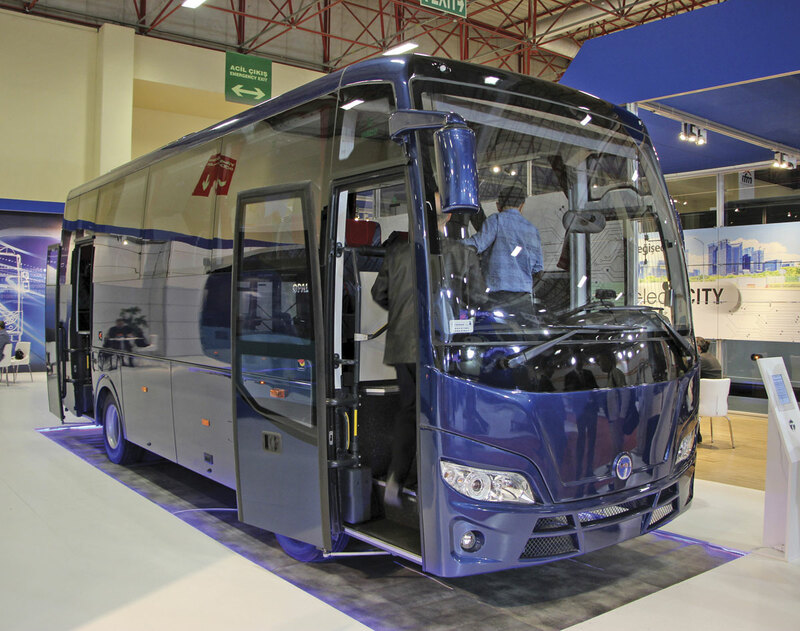 Turkey has a strong local manufacturing base but two of the biggest local players, Mercedes-Benz and MAN/Neoplan, which both have their main coach manufacturing plants in the country, chose not to attend this year, apparently citing a forthcoming show for the wider commercial vehicle market as the reason. Karsan was another absentee. The event has a very different feel to many Western European events, not least in the employment of attractive women and girls to adorn stands and vehicles. It is slightly embarrassing having to ask them if they wouldn’t mind moving for a minute to enable pictures to be taken. It is an international event, attracting visitors from Eastern Europe, the Middle East and Africa as well as from the Turkish market and Western Europe. Though some press conferences were very professional, some were less so and obtaining accurate information was at times difficult. Akia Hess Otomotiv Karoser Imalat San. ve Tic Ltd is based in Bursa and is 80% owned by Akia of Tabriz in Iran and 20% by the Turkish Ulasim concern which has a workshop and support network. It took a large stand and needed it because they unveiled a new 25m long bi-articulated prototype BRT model called the Metrobus. It has doors down both sides and claims to be the biggest in the world with a capacity of 290 passengers including 261 standees. It had a driver’s cab area at the front with a fully glazed partition separating it from the rest of the saloon, cab access being through a centre glazed door. The driver, who sat offset to the left, had a bank of CCTV cameras to his right showing various doors, though expecting anyone to simultaneously monitor six screens, even when stationary, is difficult. Although there is a link between the Swiss Hess concern and Akia, an engineer told me that the structure was stainless steel with composite front and rear sections and had been developed in house. The engine is a Euro6 Daimler OM470 unit and the transmission is Allison and though I had anticipated that it might be a hybrid it is apparently a diesel only design, though a trolleybus version with two 160kW traction motors is also to be made available. Unusually, both of the rearmost of the five axles are driven. He reported that tests had shown good performance with 55m/h achieved on a 10% hill, although this had not been fully laden. I understand no orders have yet been placed though the company is confident of winning some. 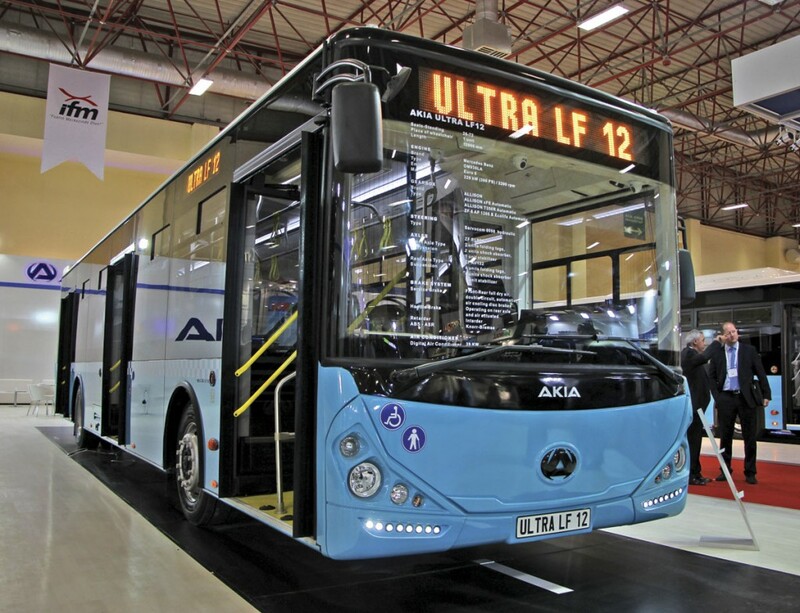 Also of interest were Akia’s two non articulated city buses, the 9.45m Ultra LF9 and the 12.m Ultra LF which have recently been facelifted to good effect. Both are also powered by Daimler engines, the 9.45m having the four-cylinder OM934LA rated at 210hp/155kW with the Allison T280R automatic gearbox and the 12m the six-cylinder OM936LA rated at 300hp/220kW and a choice of ZF or Allison transmission options. The LF12 displayed claimed a capacity of 98 split 26seats/72standees which I imagine would be very tight. Both are mounted on 22.5inch wheels and have ZF axles. 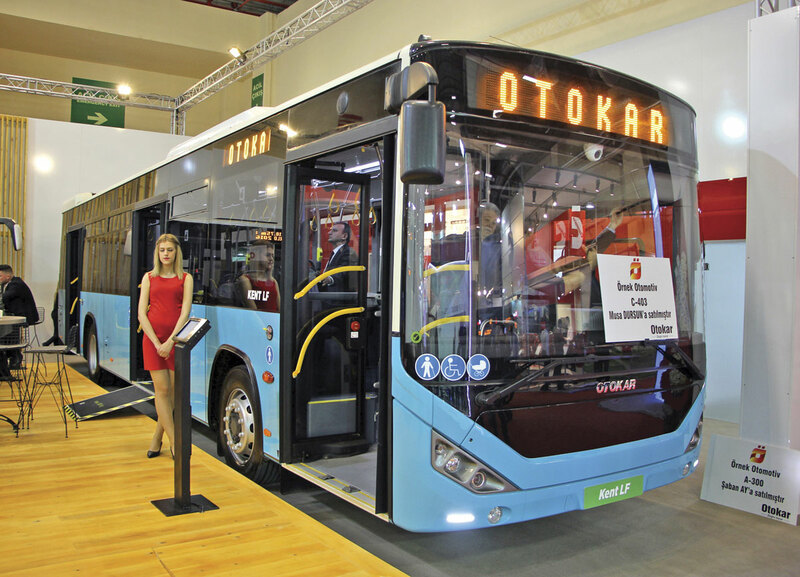 Otokar is a very major automotive player in Turkey, producing 3,531 buses and coaches in 2015, growing 16%. Research & development has averaged 3.8% over the past 20 years and in the last ten has totalled 310m Turkish Lira (£76.69m). It claims to have been the best selling brand in Turkey for the last six years and that one in three buses and two in three small buses sold were built by Otokar. It also claims to have been responsible for over half of Turkish small bus exports in revenue terms. Bus exports have been made to 45 countries accounting for 3,500 buses. The top three in 2015 were France (186), Italy (44) and Spain (44) but this year Tunisia will join the top three. It had a major presence at last year’s Busworld event in Kortrijk where it unveiled the full Euro6 range of products that it is offering in Europe. Euro6 did not become a requirement in Turkey until the beginning of this year and so the show marked the unveiling of its Euro6 line up for the Turkish market. New to Turkey was the 18.75m long Kent articulated low floor bus, the first bus of the size to be offered by a Turkish manufacturer. 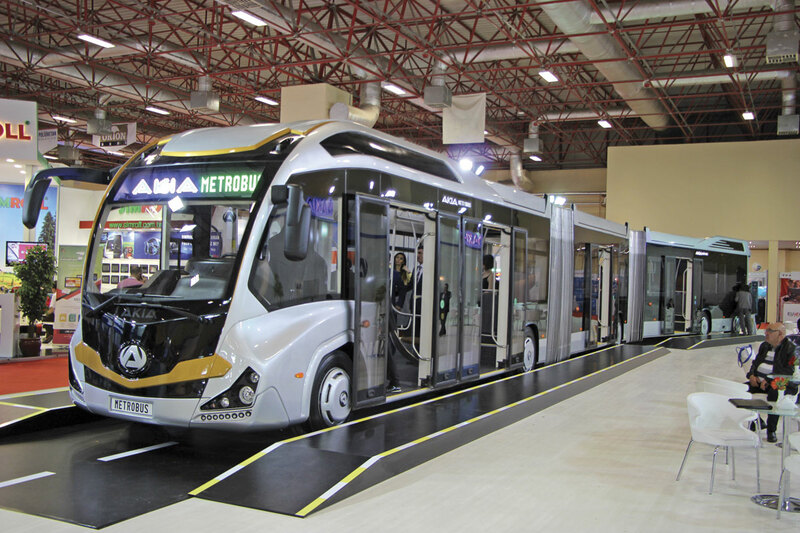 One of the first significant Euro6 tenders won in Turkey will see articulated Kent low floor city buses delivered to ESHOT in the city of Izmir. This is a conquest sale for the company and calls for all 100 buses to be delivered this year. Models have different names in Turkey and Europe with, for instance, the Navigo becoming the Sultan. Also on show were the Territo, Vectio T, Vectio C, Navigo C, Navigo U and Navigo T.
Much was made of the right hand drive Vectio C bus orders for Malta and the forthcoming order for 33 12m Kent citybuses for the same customer, delivery of which will commence at the end of June. The development is seen as offering the potential to penetrate other right hand markets including the UK, though for the time being the main UK emphasis will continue to be on the small Navigo T coach for which Noone’s and through them Minis to Midis have been appointed distributors. More on this later in this article. Unveiled on the stand were a new more attractive look for the 12m Avenue LF city bus and the long awaited new 7.7m, 33-seat, Opalin, which looks far better visually balanced than its predecessor, a model that enjoyed limited success in the UK. Temsa claim it offers the widest body (2.40m), biggest luggage capacity (4.9cu.m. ), highest seating capacity and lowest fuel consumption in its class. Also shown were the new top of the range Maraton and Maraton VIP coaches, the Avenue iBUS bus, and the Safir Plus, Safir Plus VIP, Prestij SX and the 9.5m MD9 electriCITY bus models, the last two of which were unveiled earlier this year. The electric bus has 200kWh batteries and a 100kW motor that develops 2200Nm of torque. The Maraton coach has a modern appearance and was shown in two lengths. The 12.365m Maraton had 50 seats and no toilet, while the 13.08m Maraton VIP seated only 41 and was particularly well appointed. Both have the DAF/Paccar MX11 435hp/320kW engines developing 2,100Nm but one had the Ecoshift 6S2111 six-speed transmission while the VIP had the 12AS2301 AS-Tronic gearbox. The VIP was one of 50 for the Metro concern. 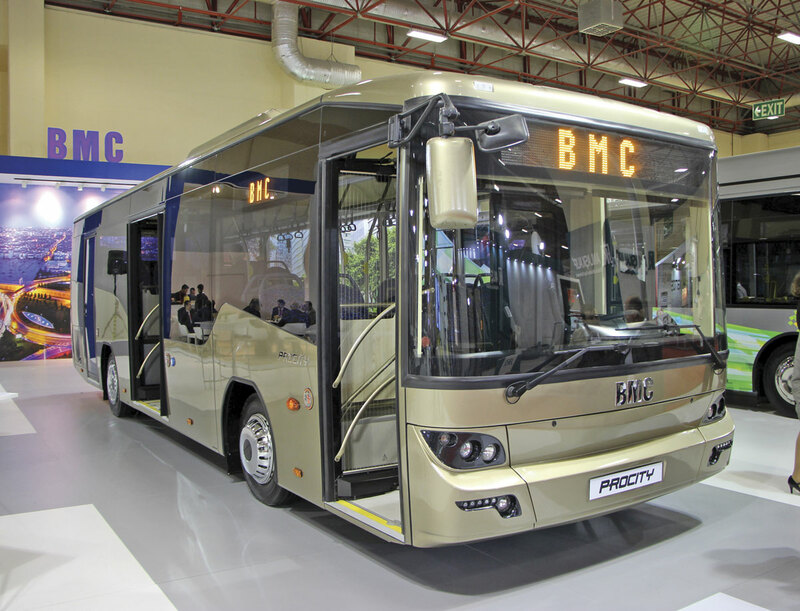 I had thought that the BMC brand had become a casualty of changing economic times and production did cease for a while, but with new owners it is not only receiving considerable investment it has plans to regain its former standing. It was bought in August 2014 and is now owned 49% by Qatari interests and 51% by two Turkish companies, one of them the Sancak Group and the other a trailer manufacturer. The MD is Mustafa Menku. It made a bold statement with its presence with no less than five ProCity models displayed. The main emphasis initially will be on the ProCity low floor city bus design in 12m form with prototypes of a new 10.05m version also shown in both two and three door versions. These showed new design elements including a wavy lower window line and see-through glazed lower panels in the centre saloon section. Demonstrating the CNG option was a 12m bus with 8.9-litre Cummins ISL-G engine and ZF EcoLife transmission. The other two 12m buses were both three door examples with Cummins ISB6.7 Euro6 diesel engines, one in IETT colours and the other in a matt red scheme. I spoke to Bulent Santircioglu, Director of the Commercial Vehicle Profit Centre, who said that around 600 buses had been produced so far, all for Turkey. Over five years the company had very big plans which were not just about Turkey. The majority of production was of 12m models and these had been further developed with a facelift and a change of identity in September. In parallel, a new generation of completely new vehicles is being developed with the new platform scheduled to appear in a year. Later on there would be models for other segments but the first priority was city buses. Sales in the UK were out of scope for the moment. Beyond Turkey the first priority would be Eastern Europe followed by Western Europe but first a strong aftersales and dealer network had to be developed. I am told that there is little chance of the Probus/Karisma midicoach returning to production and the Megastar minibus that was developed will never be prepared for production. 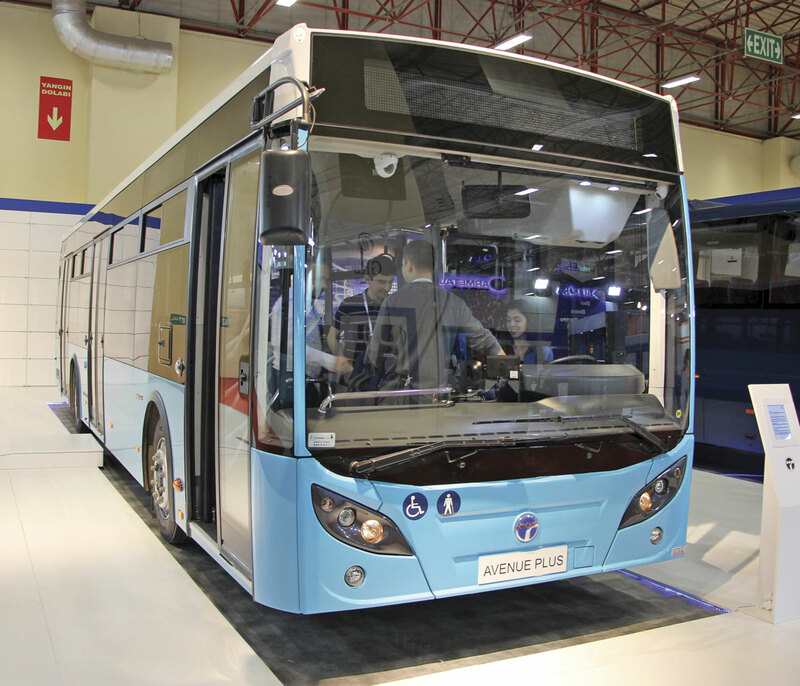 There were no completely new products on the Anadolu Isuzu stand but a variety from its Visigo, NovoCity, NovoLux Cityport city bus and Citibus ranges were displayed. Isuzu is working to be closer to passengers and said it had opened a new 6,500sq.m. R&D centre in which TL20m (UK£4.94m) had been invested. Facilities included a test centre, prototype workshop and design centre. It still builds its own engines in Turkey but not to Euro6 standard yet. The company said its main objective was to produce vehicles for export markets. To the 32 markets it already served it had recently added France, Georgia and Tunisia where new offices had been opened. The low floor Cityport city bus is 12.03m long, has a Cummins six-cylinder 6.7-litre ISBe 280hp Euro6 engine and a ZF 6AP.1200B automated six-speed transmission. The 9.515m Citibus has a four-cylinder Cummins 205hp Euro6 unit and an Allison T280R automatic gearbox. The Novocity is 7.5m with a Euro6 Isuzu 4HK1E6C 190hp engine and manual six-speed Isuzu MZZ-6F transmission. A family business founded in 1967, Guleryuz began as a bodybuilding and repair shop, introducing its first bonneted bus design in 1982, its first double decker in 1991 in collaboration with Mercedes-Benz and in 2000 introduced its own designs under the Cobra brand. It is located at Gemlik near Bursa where the capacity on the current single shift is said to be 600. It has also worked with Mercedes-Benz on the Troya midicoach. It now exports to 28 countries including Greece (buying again this year), Austria, Italy, the Vatican, Albania, Georgia, Jordan and Qatar. This year it will add Germany, where there is a new dealership, Denmark and Saudi Arabia. In Istanbul in 2015, the company were the biggest suppliers of low floor buses to independent operators with 42% of that market. It is the only double deck builder in Turkey and only builds 11m long designs. 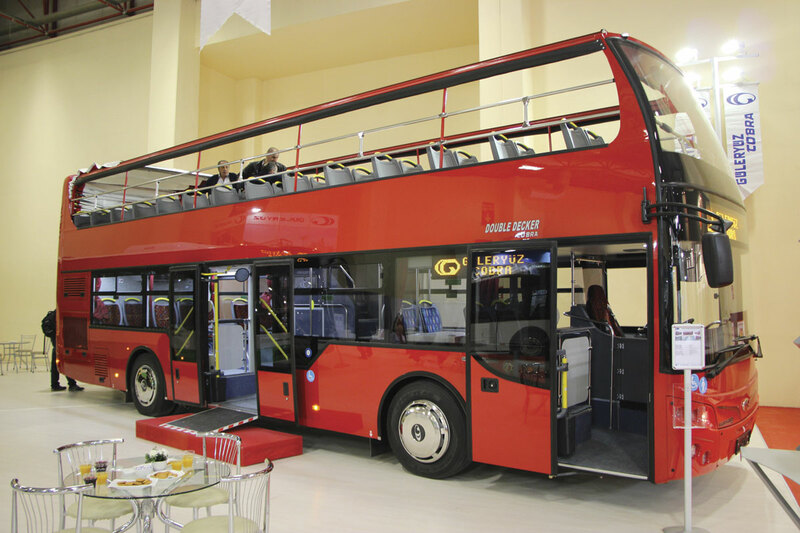 Two types of integral double decker are offered, a full low floor city bus design and an open topper. On display was one of a batch for Bulgaria which featured a Daimler OM936LA 220hp engine, ZF Ecolife transmission and ZF axles. I understand that the price of this was £153,888. All European versions currently have the Daimler unit though outside Europe sub-Euro6 MAN engines are used, with a Euro6 Cummins option under development for Turkey. Of 400-450 buses built in 2015 including exports, 100 were double deck. Approximately 80% of all double deckers exported are open top. Also shown were: a 9.33m Cobra GM220LE three door midibus which appeared (according to the specification sheet alongside it) to be offered only with a choice of Euro5 engines and a 12m GD272F low floor city bus with Euro6 Mercedes-Benz engine. 12m citybuses have been offered since 2006. The company also offers CNG powered buses and a variety of other midi options including an 11m Intercity called the GL9L. Most of one of the halls was devoted to minibuses and small coaches with a tremendous variety of product shown, albeit the majority of it mounted on either the Mercedes-Benz Sprinter or Iveco Daily. Turkey has a thriving coachbuilding and conversion industry and though some concentrate on Turkey and nearby markets others are supplying, either directly, through distributors or under other brands to markets throughout Europe and beyond. Many are very creative and inventive and quality standards are generally good and in some cases excellent. With so many UK vehicles manufactured in Turkey it should not have come as a surprise that there was one vehicle present that was destined for a UK operator. This was a Turas 900 destined for Green Mountain Travel among the coaches displayed by Bursa based Erduman. 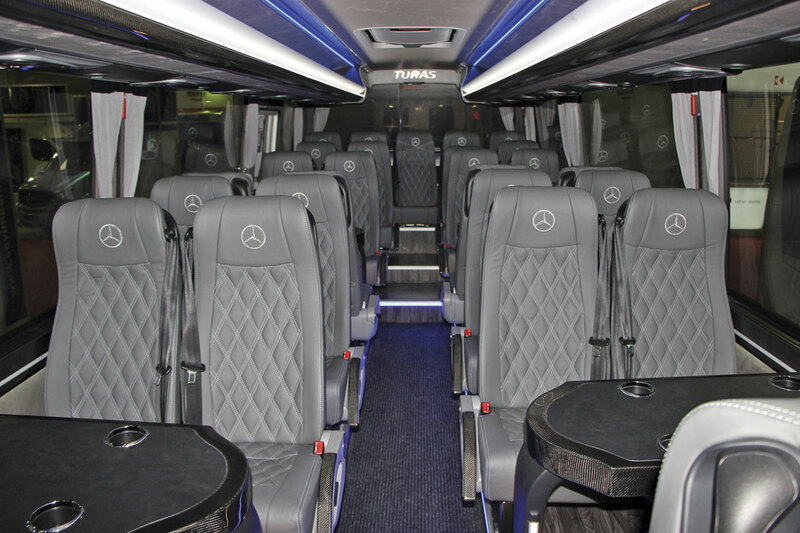 This was a VIP specification 29 seater with courier seat and four tables rather than to the standard 33-seat specification which retails at from £134,000. It is based on the Mercedes-Benz Atego 921L which is ingeniously rebuilt to give it a similar frontal look to the Sprinter. Erduman’s stand proudly carried posters proclaiming, ‘Van Partner of Mercedes-Benz’. The vehicles were well finished and the paint standard, especially on one metallic brown Sprinter was particularly high. An interesting aspect of another Sprinter was the recontoured rear with a moulded centre spine effect that reminded me slightly of an old Harrington. Erener’s publicity material pronounced ‘Shinny Cars by talented hands’ which perhaps isn’t quite what they wanted to convey. The vehicles themselves were good. There was a coachbuilt Revolution SU body with rear low floor platform on an Iveco Daily. There were two Sprinters, one of which had very attractive wood effect detailing to the cab area and there was also a smaller Vito conversion. Kartex showed three coachbuilt Sprinters, one with a low floor centre area and lots of added brightwork bling, as well as ornate wheel trim covers and a fixed external windscreen visor in the style of some 1950s cars, which would no doubt lose you much of the benefit of the improved fuel economy reported at Euro6. 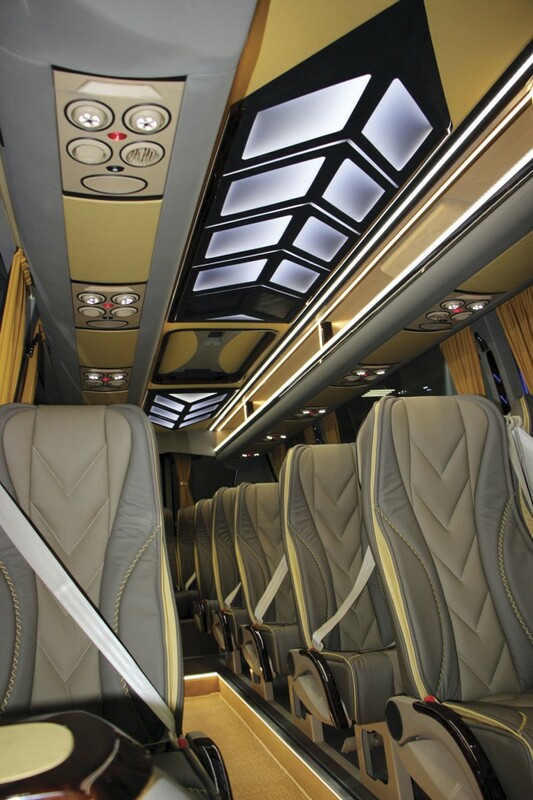 Located in Ankara, Bur-Can specialises in buses and coaches based on the Iveco Daily, most of them on the 50C17. Their five exhibits were one with a single side door and Atec lift, a two door city bus with a low rear platform, a two door bus with low rear platform featuring a 350 Revar ramp, a well specified staff bus with 22 leather trimmed Sega seats on rails, and finally a 19 seater with a ceiling panel with remote control of the colour array and a Spheros heating and air conditioning system. The conversion element cost around £15,000 and the company has plans to offer it in Russia. It was of a good standard though there were detail areas that could have been improved. Most of current production is for Turkey though some are also exported to Greece, Bulgaria and Azerbaijan and there are plans for Europe once the necessary certification has been obtained. The Spanish Ferqui company also has a Turkish operation. Its stand contained featured illustrations of the range but no complete coaches. To-Jo Karosser showed two Ilesbus conversions of Sprinters. An unusual aspect was a curvy lower side window line which looked good but might make replacement difficult. Esref Karoser displayed two low floor Sprinters. One was mounted on a 516 and had a large centre door arrangement while the other was a 416 in the purple and white colours of the Istanbul authority and had a manual side ramp, the angle of which was rather steep without a kerb to support it. CanCan-Oto also exhibited two Sprinters. The specifications of which were bizarre, certainly nothing like anything I had previously seen. They had luxury leather coach seats, quilted leather effect side panels, bespoke headlining mouldings as well as extravagant wheel disc embellishers but one also had a bus low floor centre section with manual ramp while the other was a 516 with a low floor rear section. While on the Erduman stand I saw Michael and Mark Noone. 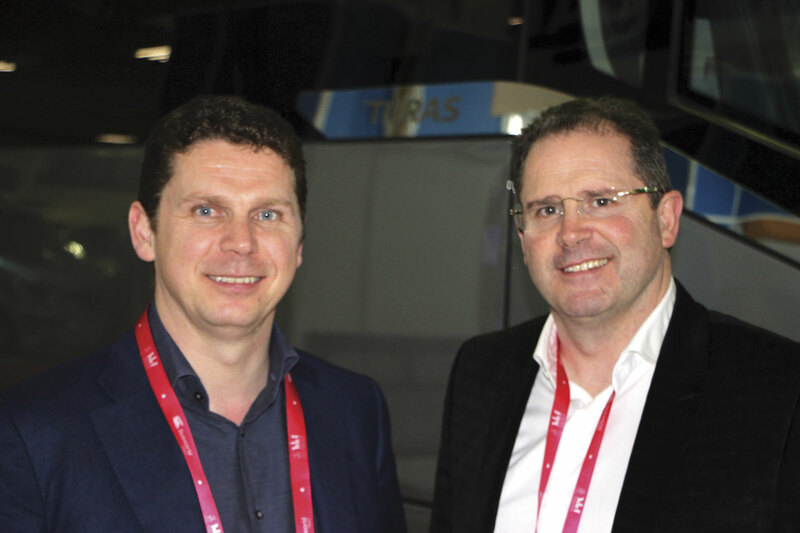 Mark told me that the 2016 season was proving phenomenal for the Turas 900, with 100 vehicles sold or scheduled for delivery in the UK and Ireland between May 2015 and September 2016. The model would be available in left hand drive from late 2016 and Noone’s will be offering it through distributors after the huge amount of interest expressed in it since Kortrijk. ‘The innovation of the entrance and the driver location has attracted a huge amount of attention. People who have them love them. We’re securing repeat and multiple orders, so there’s a lot of confidence in the product,’ he said. Asked about the new relationship with Otokar he said that the first ten production Navigo Ts were in production for April and May delivery and eight had been sold so far. Retailing at £109,000 it features 37 seats, courier seat, Cummins 180hp engine, Allison automatic transmission and 3.5 cubic metres of luggage capacity. Interest had been split 50/50 between the UK and Ireland. ‘It is a question of getting it to market so that people can see and test it. We expect it to do very well,’ said Mark, revealing that customers so far included Bartons of Maynooth, Paddywagon Tours, Burren Coaches and Tilleys. The plan with Otokar was that the Navigo T was the first vehicle to be offered, it was, ‘guaranteed that the family of products will grow.’ He praised Otokar for their high build quality and excellent engineering and said the larger Vectio T coach was ‘a possibility, describing it as ‘very smart looking.’ For the moment Noones would not be pursuing the bus sector. A considerable number of suppliers also took stands, many of them Turkish companies or Turkish subsidiaries of well known world brands, and much, if not all, of what was on display would be familiar to UK operators. There was not time to visit more than a few. 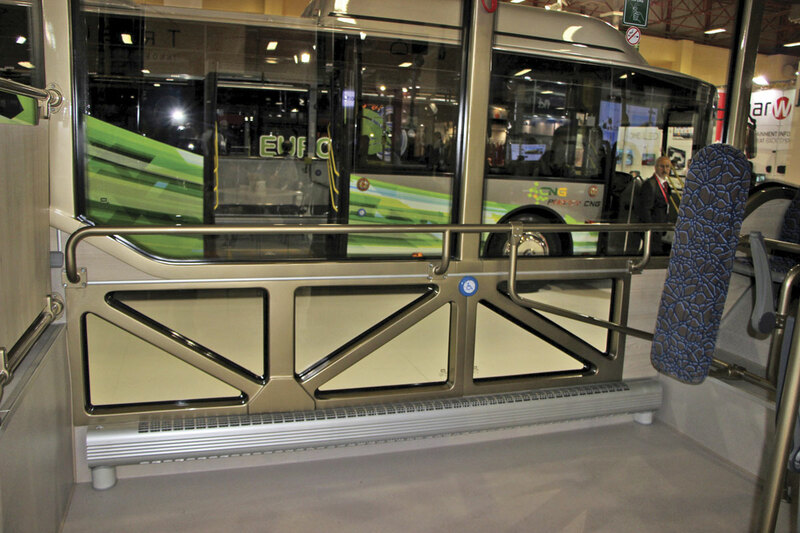 Typical was the stand of Q-Straint, who do a lot of business in Turkey where the main interest is in wheelchair restraint systems, boosted by new regulations dictating the accessibility of vehicles and resulting in new purchases as well as the modification of existing vehicles. They are not yet taking the Quantum automatic ties down system but there is interest in it. Right next to Q-Straint was that of Fogmaker, the engine fire extinguishing system. The event always generates a great deal of variety in seating options none more so than Sege, whose products are increasingly found in UK coaches with Beulas among those using them. They had over 20 different coach seat options displayed on their stand. Other seating providers I saw included: Akdulger, with a range including the Joy seat (slogan: ‘minimal elegance with style), Magna/Vogel Sitze, Yazar/Ster and Pullman Seat Systems, where the new model is the HR2014 which has individual lights on stalks. Cummins, who have manufacturing facilities in Turkey, were majoring on engines with the new SmartEfficiency ratings for 2017, complying with the OBD C Euro6 legislation, although Turkey is currently taking OBD A. The new bus ratings for the ISB4 will see torque rise from 760Nm to 850Nm while the six-cylinder ISB6 will go from 1,100Nm to 1,200Nm with a new 300hp/224kW top bus rating and a 320hp/239kW top coach rating. A new stop-start facility will also be offered along with a new starter motor, a new flywheel and a range of other enhancements. Also on the stand was the nine-litre ISL G natural gas engine offering up to 1,356Nm. ZF stressed that it could now offer a torque handling capability of 2,300Nm in the EcoLife for coach applications while bus models could now benefit from a Stop-Start facility. As well as the DIWA.6 range, Voith emphasised the availability of the award winning Aquatarder SWR which it claims is the first secondary retarder to use water from the engine’s cooling system as a coolant, enabling it to be smaller, lighter and maintenance free. Axle producer BRIST showed a variety of axle options including the IRS TJ 105-225 steerable independent rear air suspension unit. Though interesting this was not a classic show, perhaps not surprisingly given that Euro6 development has already been completed for the major European markets. Nevertheless, it served as a reminder of the immense capability that there is within the Turkish bus and coach manufacturing sector.